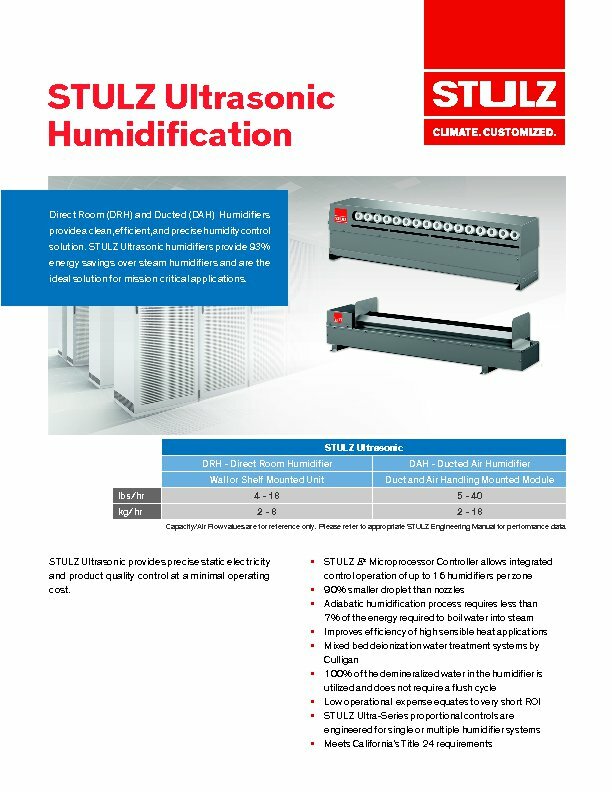 STULZ Direct Room Humidiers (DRH) are designed for stand-alone room applications. DRH are typically mounted on the perimeter wall serving mission critical applications, or any environment where tight humidity control is required. A STULZ Ultrasonic Humidifier needs only 7% of the power required by an electric steam humidifier. Assuming a humidification requirement or 20 lbs/ hr., a DAH-16 has a power requirement of 0.495 kW at 21.1 lbs/hr. Using a comparable capacity steam type humidifier, the power requirement is 6.8 kW at 20 lbs/hr, which is an energy premium of approximately 93%. In a typical application, the yearly humidification requirement is approximately 2500-3000 hrs. ROI is typically 1-2 years verses Steam or Infrared. Why is humidification important in data centers? The type of humidification used directly effects operating expenses and maintenance costs. STULZ offers portable exchange deionizers (PEDI) and total water systems.